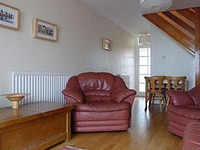 Holiday Cottages in Wales. View details for Golwg y Mor in Tywyn, Gwynedd. Provided by Holidaycottages.cc. This quiet, modern, beachside house has direct access to miles of sandy beach from sunny patio via own gate. The sea at high tide is a maximum of 15 metres from the large patio doors which give an uninterrupted view of Cardigan Bay. Dolphins are often visible in the summer. Seals appear occasionally. 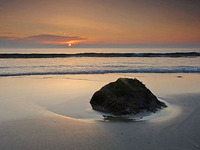 Snowdonia National Park, including the tranquil Dysynni valley, surrounds Tywyn. Ideal for walking summer or winter. 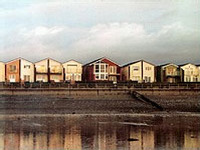 Accommodation includes 2 bedrooms (1 double with sea-view balcony, 1 twin), luxury shower room and through lounge/dining room. Full central heating, TV, CD, DVD player, radio, books, maps and games. 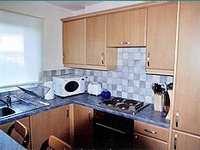 The recently fitted kitchen is well equipped with electric hob and oven, fridge/freezer and microwave. Patio furniture for those summer meals outside watching the sun go down.